Tomorrow is the 20th anniversary of the launch of the Hubble Space Telescope. It's hard to believe it's been going strong for so many years. 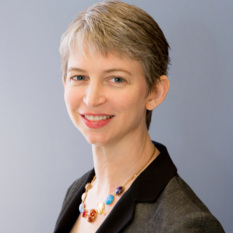 Other blogs, notably Universe Today, have been doing retrospectives on the spacecraft's 20 years of triumphs, tribulations, and astronomical observations. Rather than rehash what these other excellent sites are doing I thought I'd feature in a single blog post images of the planets and other biggish stuff in the solar system that Hubble has captured over the years. There are no Hubble images of Mercury, because Hubble is restricted from pointing close enough to the Sun to image it. Venus is the only planet Hubble can see in a crescent phase. 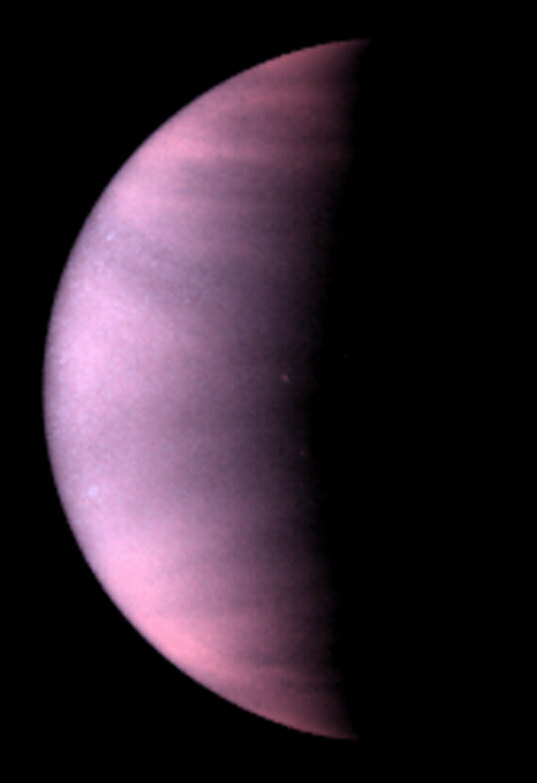 Hubble Space Telescope ultraviolet-light image of the planet Venus, taken on January 24, 1995, when Venus was at a distance of 70.6 million miles (113.6 million kilometers) from Earth. Venus is covered with clouds made of sulfuric acid, rather than the water-vapor clouds found on Earth. At ultraviolet wavelengths cloud patterns become distinctive. In particular, a horizontal "Y"-shaped cloud feature is visible near the equator. Similar features were seen from Mariner 10, Pioneer Venus, and Galileo spacecraft, and are currently being observed by Venus Express. The polar regions are bright, possibly showing a haze of small particles overlying the main clouds. The dark regions show the location of enhanced sulfur dioxide near the cloud tops. From previous missions, astronomers know that such features travel east to west along with the Venus' prevailing winds, to make a complete circuit around the planet in four days. The image was taken with the Wide Field Planetary Camera-2, in PC mode. False color has been used enhance cloud features. 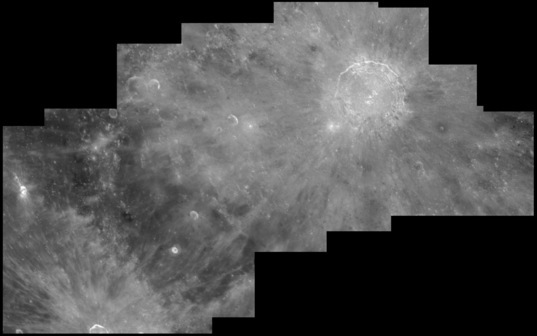 Hubble Wide Field and Planetary Camera 2 mosaic of crater Copernicus. Hubble's crisp bird's-eye view clearly shows the ray pattern of bright dust ejected out of the crater over 1 billion years ago. Hubble can resolve features as small as 600 feet (200 meters) across in the terraced walls of the crater, and the hummock-like blanket of material blasted out by the meteor impact. The view was captured on April 16, 1999. 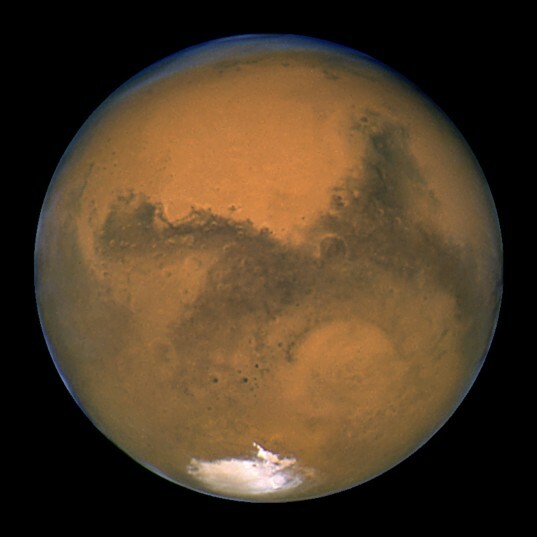 Hubble has been used to shoot Mars at nearly every opposition since its launch, with much of that imaging being led by Planetary Society President Jim Bell as the principal investigator. Here are just a couple of highlights. This photo was captured by the Hubble Space Telescope during Mars' closest approach to Earth in over 60,000 years, on August 27, 2003. 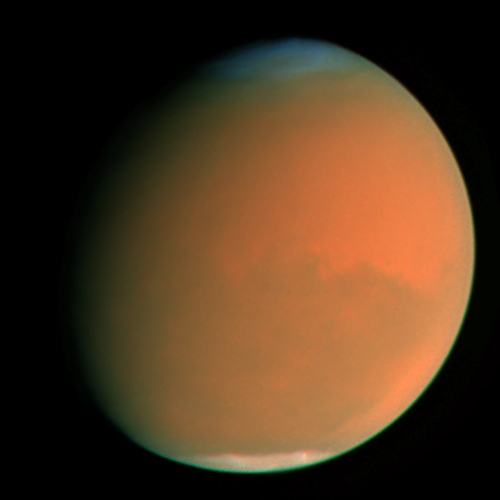 A global dust storm on Mars in 2001 engulfed the entire planet for more than three months. Jupiter is so big that it more than filled the Planetary Camera high-resolution chip on Hubble's Wide Field and Planetary Camera 2, so lots of Hubble's best shots don't show the whole globe. 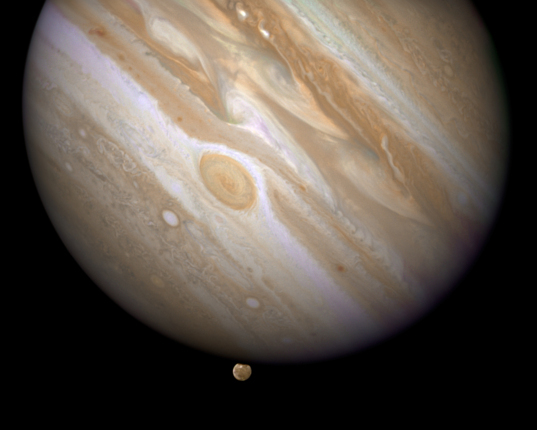 On April 9, 2007, Hubble caught Ganymede in the act of setting behind Jupiter. Ganymede is the largest moon in the solar system, bigger than the planet Mercury. 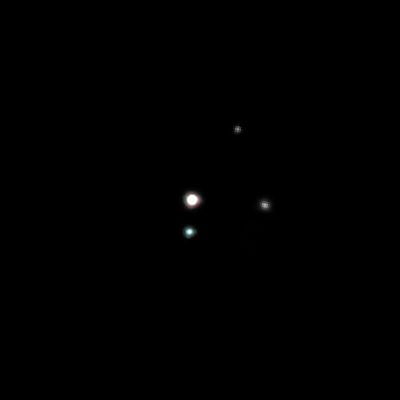 Three images of Jupiter taken by the Hubble Space Telescope in May, June, and July 2008 show three red spots mixing it up. All three red spots are anticyclonic storms. The storms move along the boundaries between Jupiter's belts and zones at different speeds, so confrontations are inevitable. These images document the fact that the Little Red Spot moved past the Great Red Spot relatively unscathed, but the same wasn't true for a new, "baby red spot," located at a latitude in between the two. After the baby spot's encounter with the Great Spot, it has lots its color and appears deformed. As with Mars, Saturn's been a frequent target for Hubble, whose observations helped fill in the gap between the Voyager and Cassini visits to the planet. 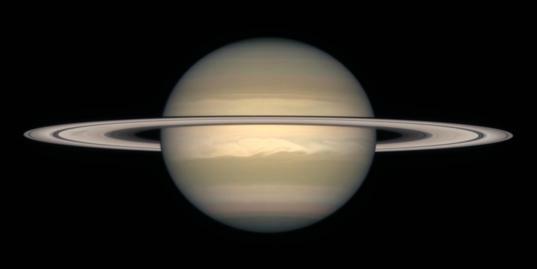 The Hubble Space Telescope captured images of Saturn every fall from 1996 to 2000. During that time, Saturn moved from southern spring to summer, and the rings opened as seen from Earth. 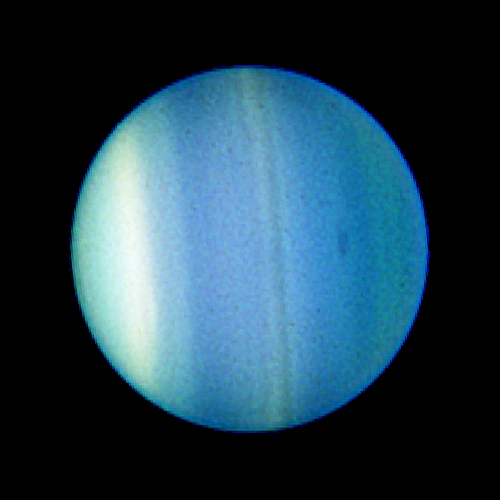 The continuity of Hubble's observations have been key to watching the changing seasons on Uranus. As Uranus approached its equinox on December 7, 2007, the planet's storm activity was heating up. Each day exposed more of its northern hemisphere to sunlight for the first time in decades. 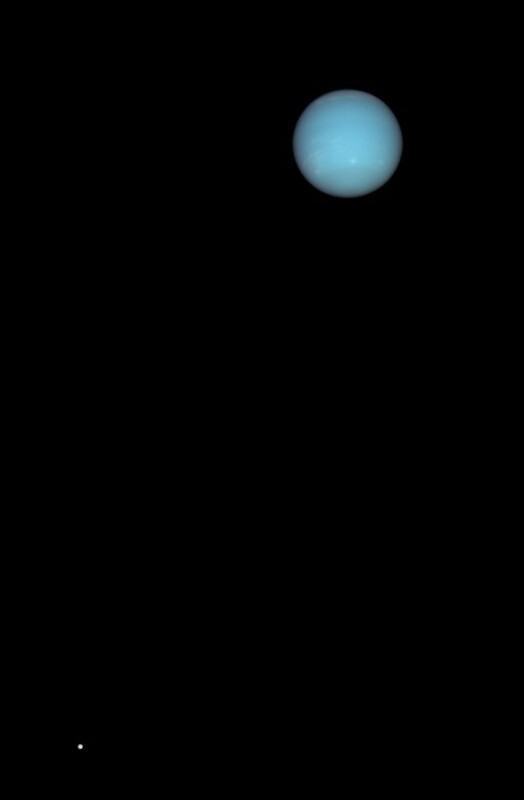 The Hubble Space Telescope targeted Uranus on August 24, 2006, capturing this view of new dark spots in the northern hemisphere. Neptune's far enough away that it's small even to Hubble, but the great telescope still resolves major cloud features. One of the best images of Neptune taken by Hubble employed the now-defunct high resolution channel of the Advanced Camera for Surveys (ACS). Lots of cloud features on Neptune are visible, and there are hints of albedo variations on Triton. Hubble photos have yielded discoveries of moons of Kuiper belt objects, and information on the surfaces of some of the most distant objects in the solar system. Hubble can barely resolve Pluto, though; to learn much more about it, we'll have to wait for New Horizons' visit. Hopefully what New Horizons tells us about the four bodies in the Pluto system, as well as any other Kuiper belt object it studies, will generalize to the other bodies observed by Hubble. This and another photo from the Hubble Space Telescope have revealed that Pluto has two more, small moons in addition to the previously known Charon. Here's one more planet for you! 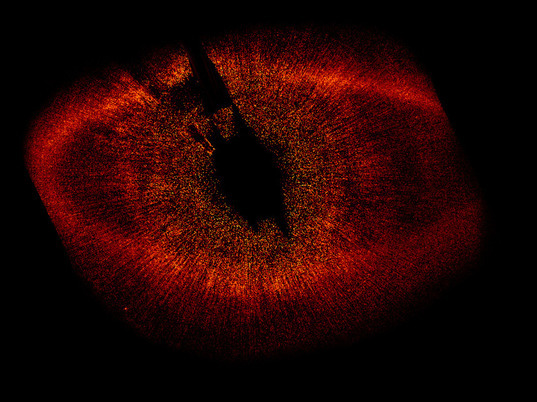 Fomalhaut b, beyond our solar system entirely. Hubble Space Telescope image of planet Fomalhaut b orbiting the star Fomalhaut. Scientists imaged the planet by using a coronagraph that blocks out the star and it immediate vicinity. This accounts for the dark region at the center of the image. Hubble doesn't have 20 more years of observations ahead of it; but it should have four or five at least. Hooray for Hubble!